The tradition of concert bands at Iowa State University goes back over 100 years! Currently, there are four concert bands - the Wind Ensemble, the Symphonic Band, the Concert Band, and the Campus Band. All students are eligible to participate in any of these ensembles. Auditions for the Wind Ensemble and Symphonic Bands are held at the beginning of fall semester. Typically, we ask to hear one or more etudes or solo works that display your slow, lyrical playing and your faster, more technical ability. There is no audition for membership into the Concert Band. Auditions are also held at the beginning of the spring semester based on the vacancies which may exist in each of the bands. A sign-up sheet for these 7-minute auditions will be posted on the band bulletin board, beginning August 15, 2018. Brass auditions will be held throughout the day on Monday, August 20. Woodwind auditions will be held throughout the day on Tuesday, August 21. If you are a percussionist and you are auditioning for either the Wind Ensemble or the Symphonic Band, please prepare the attached excerpts below for your audition. Percussion auditions will be held on Monday evening, August 20 - and there will be a sign-up sheet for these auditions posted on the percussion bulletin board beginning August 15, 2018. The concert bands perform on campus in both the intimate 309-seat Martha-Ellen Tye Recital Hall in the Music Hall and the 2,700-seat C.Y. Stephens Auditorium, recognized as one of the finest performance halls in the world. 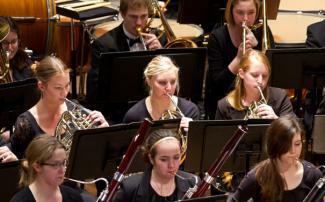 The concert bands also perform at Ames City Auditorium, located at 515 Clark Ave. There are a number of departmental scholarships available for music majors. There are also scholarships available for outstanding musicians on "need" instruments regardless of major. Auditions for the departmental scholarships are held in January and February and also serve as an entrance audition for music majors. Click here to learn more about available scholarships. To learn about upcoming performances of the ISU Concert Bands, click here. The Wind Ensemble is recognized as the top concert band at Iowa State. Striving for perfection and playing for the love of music, the sixty members of the Wind Ensemble perform the finest quality literature composed for winds including music from the 16th century through the most contemporary works available for winds. The Wind Ensemble performs works for smaller chamber ensembles to the full ensemble. Members of the Wind Ensemble have exceptional opportunities to work with some of the world's greatest composers, conductors and soloists. In recent years, these have included John Corigliano, Frank Ticheli, Timothy Reynish, Michael Daugherty, Andrew Ardizzoia, David Waybright, John Whitwell, Simon Estes, the Dallas Brass, Leigh Howard Stevens, John Philip Sousa IV, Joseph Hermann, Pat Sheridan, and the Boston Brass. The group regularly commissions and premieres new compositions. 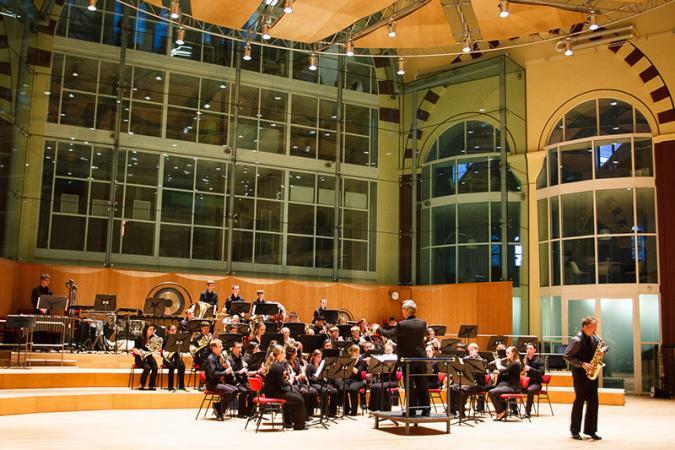 On campus, the Wind Ensemble presents approximately six concerts each year, performing in Martha-Ellen Tye Recital Hall and C. Y. Stephens Auditorium, one of the finest performance halls in the world. 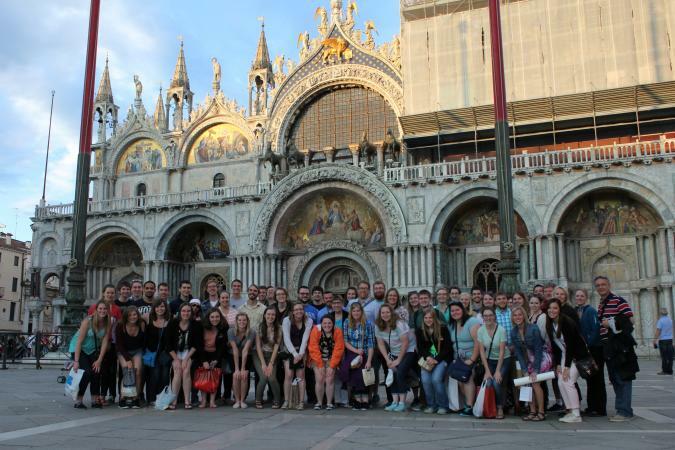 Members of the Wind Ensemble in front of Saint Mark's Cathedral in Venice, Italy during their 2015 tour. Off campus, the Wind Ensemble has performed in Minneapolis' Orchestra Hall and in Chicago's Orchestra Hall at Symphony Center. Since 2003, the Wind Ensemble has had six tours to Europe, with visits to London, Amsterdam, Bruges, Vienna, Prague, Salzburg, Paris, Ulm, Rothenburg, Brussels, Munich, and Stuttgart. Their most recent tour in May, 2015 included stops in Rome, Florence, Venice, Salzburg and Rothenburg. The Wind Ensemble performed for the 2016 College Band Directors National Association North Central Division convention which was held at Iowa State. Under the direction of Michael Golemo, they have performed four times at the Iowa Bandmasters Association convention, most recently in 2014. The Wind Ensemble is conducted by Michael Golemo, Director of Bands. Photos from the ISU Wind Ensemble trip to Rome, Florence, Vencie, Salzburg, and Rothenburg in May 2015. The Symphonic Band is an 80-member ensemble that explores traditional as well as contemporary works by composers such as Percy Grainger, Malcolm Arnold, Gustav Holst, Ralph Vaughan Williams, and Leonard Bernstein. The Concert Band performs a variety of rich literature. 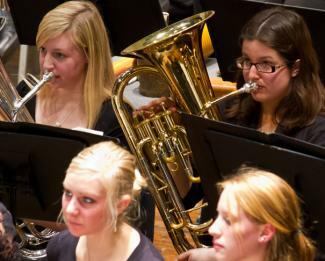 Approximately 100 students take part in this group, enjoying continued musical involvement at the college level without excessive performance pressures or rehearsal time. The Concert Band is conducted by Javan Shields, Assistant Director of Bands. The Campus Band performs a variety of rich literature. Approximately 120 students take part in this group, enjoying continued musical involvement at the college level without excessive performance pressures or rehearsal time.